Is there still a rivalry between UNC and NC State? North Carolina’s Research Triangle has developed into one of the greatest areas in the nation. It is home to multiple companies and organizations, multiple outstanding institutions, and the center of North Carolina’s government. However, in the middle of college sports season only one thing matters: what color blue you are wearing. When UNC and Duke University collide, the games not only create great moments for sports fans nationwide, but also a fierce hatred between the opposing teams. However, one major school has constantly been left out of any sort of discussion of Triangle sports in recent years: the North Carolina State athletic program. Placed only thirty minutes from Chapel Hill, it is somewhat shocking that NC State is not even mentioned as a rival in any sort of campus dialogue by not only the UNC community, but also a large portion of the sporting community. This has not always been the case. On October 12th, 1894, the first meeting between the football programs of the University of North Carolina at Chapel Hill and the North Carolina College of Agriculture and Mechanic Arts (who would officially change their name to North Carolina State University at Raleigh in 1963) occurred in Chapel Hill, North Carolina. What started with UNC winning the game 44-0, resulted in the start of a series of twelve games between the two schools until 1905. UNC won eight of those games, and the other four were ties. Another game wasn’t played between the two schools until fourteen years later, and in 1920, one year after the series was continued, NC State got its first win in Raleigh. For comparison, UNC played a series of seven games with Trinity College (based originally in Trinity, North Carolina before moving to Durham) from 1888 to 1894 before beginning a series in 1922, with the introduction of a “Victory Bell” in 1948 to the victorious team. The only team that was close in proximity to Chapel Hill simlar to that of NC State that had a better series than any two of these teams would be, what is now known as, Wake Forest University (then based in Wake Forest, North Carolina). This series was only played five times between 1888 and 1893, but a series began in 1908, sooner than either the series between State or Duke. Soon, basketball was picked up by these schools and the series found yet another battleground to fight on. There was something indeed special between UNC and NC State. And after Wake Forest moved to Winston Salem in 1946, there was only two schools Carolina had to worry about.So, what turned the tide towards the now nationally recognized UNC-Duke rivalry? The introduction of Mike Kryzewski as the head coach of the Duke basketball program. By 1980, UNC had one of the most dominant basketball programs in the nation. Great players had played for the Heels, including Larry Brown, Bobby Jones, Billy Cunningham, and Robert McAdoo. In addition, UNC won a NCAA tournament in 1957, and Coach Dean Smith had made numerous, and almost consistent, appearances in the NCAA tournament since the early 1970s. NC State had some success, winning an NCAA tournament in 1974, but it was a step down from what was happening in Chapel Hill. Duke had almost nothing. There were a few conference stars before 1980, but nothing compared to what was happening beyond the Durham city limits. 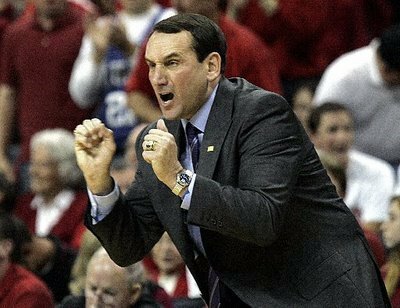 So on March 18th, 1980, Duke University hired Mike Kryzewski after a five year stent coaching for the Army basketball team in hope of building a dominant basketball program. Since that signing, Duke has won four national championships, and had numerous talented players rise through the roster. Another competitive team had indeed risen up in the Triangle. But as one rose up, another dramatically fell apart. In 1989, the book Personal Fouls—The Broken Promises and Shattered Dreams of Big Money Basketball at Jim Valvano’s North Carolina State claimed that the Wolfpack program had gave large sums of money to players, had been covering up positive drug tests, and had the grades of certain players altered to make sure they were eligible to play. 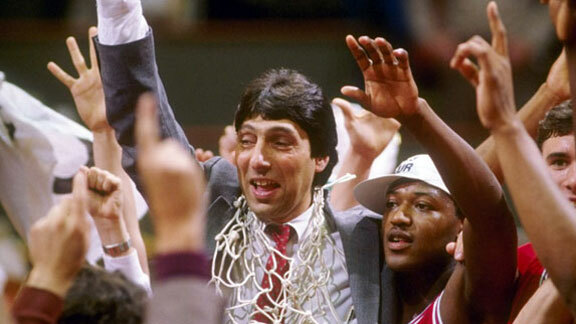 Head coach Jimmy Valvano, who led NC State to an underdog victory in the 1983 NCAA tournament, resigned in the spring of 1990 due to these charges and the program wouldn’t make an appearance in the NCAA tournament from 1991 until 2002. That wouldn’t be such a large deal, if the other two schools in the Triangle weren’t making one memorable moment after another. Duke won its first NCAA tournament in 1991, followed with their second in 1992. UNC won its third NCAA tournament the next year after that. February 28th, 1981: Duke upsets #11 UNC in overtime. March 10th, 1984: #16 Duke defeats #1 UNC. February 5th, 1992: #9 UNC defeats #1 Duke. March 4, 2006: #13 North Carolina defeats #1 Duke in Durham on Senior Night. And probably the one UNC fans may remember the most from recent history, March 4, 2007: #8 UNC beats #14 Duke, even after Gerald Henderson gave a cheap shot to Tyler Hansbrough and broke his nose, causing it to bleed ferociously… on national television. While all of this is happening, the folks over in Raleigh were left in the dust with nothing extraordinarily memorable to salvage between either foe. Sure, there was a few upsets, but nothing that stuck with a national audience, who began to realize that ACC football had nothing compared to ACC basketball. While Duke has taken the forefront in ticket sales and student expectations on the team to beat each season that doesn’t just mean we should forget that history, the similarities, and legacy the two public universities in the Triangle have. That carries over, and that shouldn’t be ignored for anything. Yes, even if a more challenging opponent out there. However, that hasn’t stopped some, if not a majority, of members in the UNC community from ignoring NC State completely. Any student who goes to UNC currently knows that the chant at the end of our fight song is “Go to Hell, Duke”, which of course, has understandably changed with the times. This is not necessarily wrong, and it is quite understandable. I don’t blame that on a blind ignorance of sports history, but a different culture the student body has grown up around. When you are growing up in a culture in which the “Tobacco Road” rivalry is having not only countless moments being made and aired on national television, but also books and movies being produced, certain things will get weeded out as a result. Even then, NC State is getting pushed further out of the picture. As recent as the February 2013 basketball game between UNC and State at the Dean Dome, Carolina fans ended the game by chanting “Not Our Rivals” as the clock winded down. There are even some individuals who go even further and start blaming NC State fans for why they are getting pushed out. Hardison continues by blaming this on a select group of NC State fans. These include a few individuals on a Scout.com forum who suggested that “Dean Smith’s Alzheimer’s was exaggerated so he could retire early and that Roy Williams faked his cancer scare in 2012 to escape an impending NCAA investigation” (from Mr. Hardison’s own words), a group of individuals who stalked Hadyn Thomas (the individual who rented the GMC Yukon UNC basketball player PJ Hairston got caught doing certain illegal activities in), and even a “We the People” petition asking the federal government to take action and investigate UNC. First off, to Mr. Hardison, blaming any overall group of individuals on a fringe of fans is not only wrong, but it is horribly immature to blame possibly thousands of people on a select few. To quote the Merriam-Webster dictionary, a fringe is “an area of activity that is related to but not part of whatever is central or most widely accepted”, or “a group of people with extreme views or unpopular opinions”. Believing forums, a few crazy fans, or an online petition that includes such important topics such as building a working Death Star by 2016 and investigating Jimmy Kimmel for a bad sketch (both of which have more signees than the investigating UNC petition based on your quote in your article) not only shows that you had no solid evidence for proving your case, but your lack of proper research towards striving for the truth. If you claimed that the rivalry was no longer existent because of the growth of Duke Basketball under Coach Kryzewski, that would be a respectable position that would create a dialogue. But, since you blamed everything on this relatively microscopic population of State fans, nothing substantial can be talked about, as you have forced the conversation in a small box with your limited and poor information. Speaking of fringe fans, it is something a lot of groups suffer from. Possibly, even UNC. 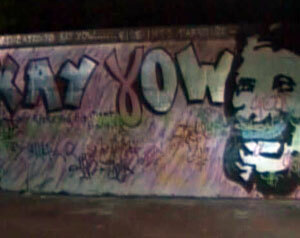 In late January 2009, a large portrait of the late NC State University women’s basketball Coach Kay Yow at the Free Expression Tunnel on NC State’s campus was defaced by light blue graffiti and profanity. Some of the defacements included putting a blue mustache on the portrait of Yow and the words “cancer rules” on the art work. To make matters worse, Yow died one week before the incident from breast cancer, and UNC had beaten State the night before in basketball. Immediately, the blame got placed on UNC, and the UNC went into a hectic mode apology, praying it wasn’t a Tar Heel who did this. These fans (if even done by Carolina fans. No one knows who the culprits are after almost five years since the incident) obviously don’t represent the Carolina Way of life. These NC State fans on the forums, in Mr. Thomas’ personal life stalking him, or those signed under bad web petitions do not represent the average NC State fan. Mr. Hardison, I hope you understand this. I hope that you understand that your overly biased and under researched pieces may attract a lot from the home crowd (especially after getting shared on the UNC Memes Facebook page), but it only creates one side for a conversation, instead of opening up a dialogue. This isn’t the first time the blog you are part of has been called out for poor journalism. Let us get back to if the is a rivalry still between UNC and NC State. If there is one statement that could simple turn the tide towards once again having a UNC-NC State rivalry, it is this: we are family. If you currently go to or have graduated from Carolina in recent years, there is a high possibility you have friends or family that have spent some amount of time at NC State getting an education. I am one of those individuals. Not only did some of my immediate family members attend NC State, but so have some of my friends from my hometown of Weddington, other conservatives I had the pleasure of going to CPAC with last Spring, and so on. The relationship between the two schools is so intertwined in our personal lives. It could even be fair to compare the relationship to one between two local high schools. There is so much culture and similarities shared between the two that it is crucial for the other school to win. For a brief period of time, they may brag to your face about it, but after the game, you go and hang out with them, you laugh and smile with them, and share in a moment of appreciate for the relationship you share. I’m not trying to take anything away from the UNC-Duke rivalry. Unless the 1980s repeats itself with NC State and Duke switching roles, nothing will change with what has emerged between the Tar Heels and the Blue Devils. However, for a few times a year, it may be okay to hate on the color red and the school that is associated with it. This is not because both UNC’S and NC State’s histories say so, but because our own personal histories believe it to be so.